It is hard to believe that Year Four of cruising Mexico is a wrap. It seems like just yesterday that we rounded the Baja cape with the 2012 Baja Ha Ha fleet and started exploring Mainland Mexico and the Sea of Cortez. When I review our photos from each year though I'm amazed at how much we have done and seen and how many wonderful Mexican and Expats we have met. Our cruising season this year was different than prior years. We drove our car down and spent more time in La Paz and La Ventana. Having a car really changed our experience in Mexico. It made everything easier, just like home. Getting groceries, going to the movies, finding a special boat part, visiting friends, going out to eat. No problemo! This years we also encouraged many guests. Hotel Shindig was open for business and we enjoyed many visitors, showing them around La Paz and the nearby islands. Our final project before putting Shindig to bed was a haulout. New bottom paint, new cutlass bearing and a new thru-hull fitting were the big items. All went well at the boat yard and we won't have to haul out again for another 2+ years. 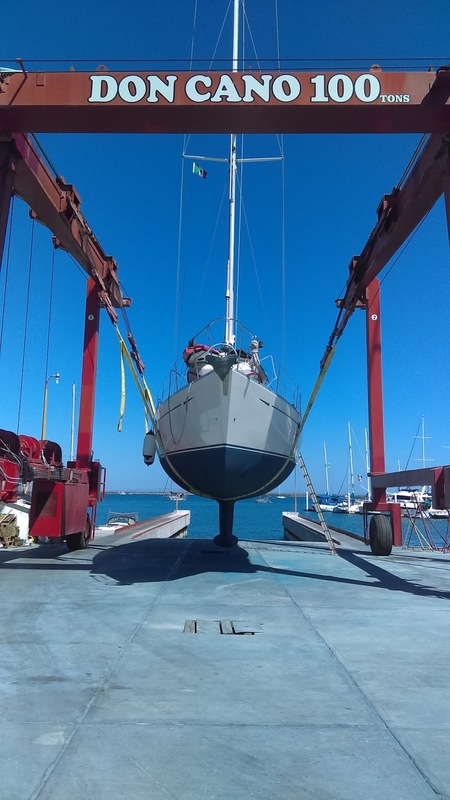 Shindig is now safely tucked away in her slip at Marina Palmira. She is hibernating for the hot Baja summer. While we are gone Tom and Jeanne from La Paz Cruisers Supply are watching over her . She is in good hands. So, what is next for the mighty Shindig and her crew? This summer we are setting up a new home base in California. After being homeless for the last several summers it is time to get a new place we can call home when we are not on the boat. That process is coming along nicely and we should have more to report in August. Our cruising plans for next season are taking shape too. We plan to spend another 1/2 season in Mexico and then Puddle Jump to the South Pacific in 2017. There are several boat projects to accomplish before the big trip but for the most part Shindig is ready to go. 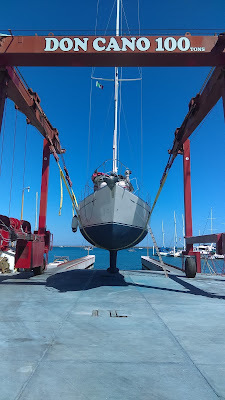 She has a new bottom, the mast, standing and running rigging are all in tip top shape and all systems are go. 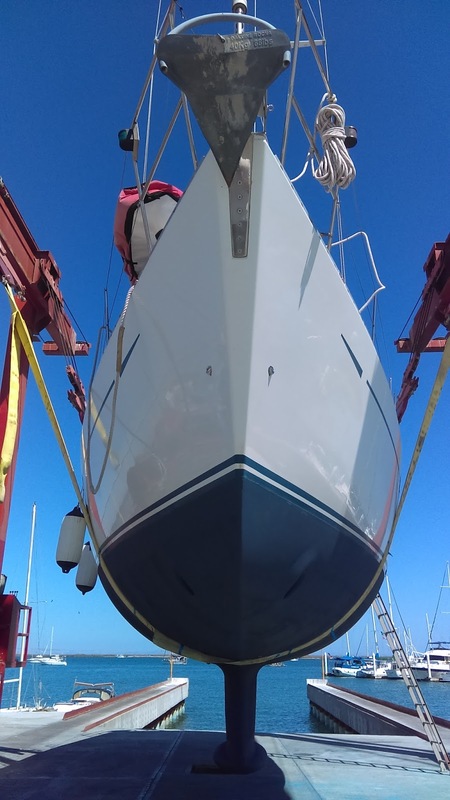 Here are a few photos from the boat yard. Following our visit with Elaine and JD in April we headed north into the Sea of Cortez. Our plan was to make it as far North as Conception Bay and rendezvous with Mom and Dad (Bert and Alice) aboard Elegante. Just as we were leaving the Loreto area our AIS indicated that a buddy was close by. Cool Change was in the neighborhood. Rick and Cindy are friends from Sausalito where Shindig called home before we left in 2012. It was great to catch up with old friends and share stories about our Mexican adventures. Rick and Cindy have been doing a lot of inland travel and had a wonderful season on the Mainland. We keep in contact with Mom and Dad on the ham radio and made plans to meet up at Punta Chivato at the north end of Conception Bay. They were traveling south after enjoying the Bay of Los Angeles for several weeks. Shells of all types can be found at Punta Chivato. It is an amazing beach to explore. Shell Beach at Punta Chivato. There was enough wind for Rob to get out on the kiteboard. Miles and miles of bay to play on. Playa Requesón was a new anchorage for us. It is located about 10 miles south of the main anchorages in Conception bay. Beautiful! Gearing up for a hike with Pamela and Jeff(SV China Cloud) at Candeleros Chico.